Real Estate Scorecard is an industry leader of online real estate reviews, keeping buyers informed about what's happening at the most popular gated communities and best cities to live in Florida, Georgia, the Carolinas, Tennessee and Central America. 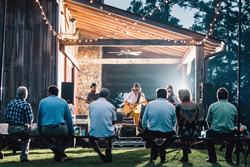 Covering the best of southern culture, Garden & Gun Weekend is coming to Reynolds Lake Oconee with an event Real Estate Scorecard knows folks won't want to miss. The September event promises to be a weekend full of food, music, fireworks, and southern entertainment. Often considered one of the best places to live in Georgia, Reynolds Lake Oconee is the perfect setting for the event, with its scenic lakeside views and beautiful open spaces. Garden and Gun typically chooses places like Reynolds that exemplify southern living. Join Garden & Gun for this fun and luxurious weekend. Book the G&G Package now through The Ritz-Carlton Reynolds, Lake Oconee. This exquisite hotel is one of the most elegant lake resorts in Georgia, where guests enjoy championship golf, fine dining, a first class spa, and world class fishing and boating on spectacular Lake Oconee. PLUS: Complimentary resort activity package including overnight valet parking, internet, non-motorized lake recreation, bike rentals, golf transportation and more, all at Reynolds Lake Oconee. Lake Oconee is one of the most magnificent freshwater lakes in Georgia. Actually a man-made reservoir, the lake boasts over 350 miles of scenic shoreline. Along its shores are creeks and rivers, natural forests, and plenty of places for water sports and fun outdoor activities. At Reynolds Lake Oconee, the developer created a place for people to live on this beautiful lake. Located 80 miles west of Atlanta, the community is a natural haven just outside the city. One big benefit of living inland is the distance from the coastal risks of storms in hurricane season and the award winning master planned community is built below the snowline. But for residents of Reynolds Lake Oconee, these are not the reasons for its popularity. Those who live here enjoy signature home plans, first-class amenities, outdoor activities, six championship Lake Oconee golf courses, and all the views and splendor of the incredible lake. Signature home plans at Reynolds Lake Oconee include cozy, 3-bedroom single family homes, from around 2800 sq. feet to more than 4300 sq. feet. Layouts vary to include covered southern porches, spacious modern kitchens, breakfast/sitting rooms, large walk-in closets, and optional 4th and 5th bedrooms. Signature home plans are designed by 4 select members of the Reynolds Plantation Builders’ Association, all of which are seasoned masters in the building craft. The Lake Club Tennis Center, with two stadium-sized and 6 championship-sized, lighted courts as well as clinics, private lessons, and a full-service pro shop. Four full-service marinas offering dry dock storage, marina stores with fishing and boating supplies, full-time mechanics, and dockside fueling. Pontoon boat rental is available, as well as a variety of other watercraft including canoes, kayaks and paddleboards. Fishing, swimming, boating, skiing, camping, picnicking and water-skiing on Lake Oconee. The Lake Club with over 38,000 square feet of indoor & outdoor pools, Kathy’s Café, fitness facilities, banquet & event space. The Ritz-Carlton Spa, with 251 rooms, a 4-star rated spa, private beach, and a choice of fine, casual and lakefront dining. If folks would like to visit during the Garden and Gun Weekend at Reynolds Lake Oconee, to enjoy the event, check out the signature home plans, or even play a round on a Lake Oconee golf course, then book tickets now. Oftentimes events like this sell out quickly. For information about the event and to schedule a visit, contact Reynolds Lake Oconee directly at 800-800-5250. Real Estate Scorecard writes unbiased real estate reviews providing in-depth information about popular gated communities in Florida, Georgia, the Carolinas, Tennessee and Central America, all in an effort to help people discover where to retire in the South.